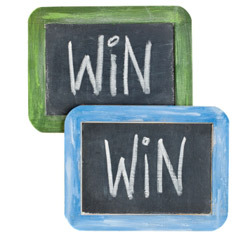 “Win-win” has become a popular term in the field of negotiation, but many people have mis-perceptions about what it actually means. In this blog post, Professor Lawrence Susskind, a member of PON’s Executive Committee, clarifies that a “win-win” negotiated outcome is one in which both sides walk away with more than their “best alternative to a negotiated agreement,” or BATNA. This is not the same as an agreement in which everyone walks away with everything they originally wanted, which is extremely rare; most successful negotiations require some concessions from all parties. Susskind suggests that careful preparation and clear thinking about your own BATNA and that of your counterparts can help negotiators obtain true “win-win” outcomes.